Did you know that before it became a state, Washington was called Columbia (named after the Columbia River)? How about that the highest point in Washington is Mount Rainier, named after Peter Rainier, a British soldier who fought against the Americans in the Revolutionary War. Okay, last one, we promise. Did you know that Washington is absolutely stuffed to the brim with superb resorts and lodges? Here are a few of our favorites! Take a deep breath of salt air and enjoy the view - it doesn't get much better than Hi-Tide Ocean Beach Resort. From the lanai of your private oceanfront condominium you'll enjoy maximum comfort as you observe the marvelous wonders of nature. The Moclips River snakes around the property and eventually empties into the ocean, leaving the resort on a stately natural peninsula. Inside you'll find fully equipped kitchens, a cozy living room with a fireplace, sleeper sofa, flat panel HD TV, DVD player, complimentary Wi-Fi and, of course, the resort's famously dynamic views. Step outside and observe the eponymous high-tide as you walk along the beach. Investigate a tide pool or two to see a tiny ecosystem at work! The resort is a 1.3 miles from the Museum of the North Beach, a 2.9 miles from Pacific Beach State Park, and a 30.6 miles from Aberdeen. There's an on-site convenience store, along with a BBQ and picnic area, and free off-street parking. Ar The Resort at Port Ludlow, you'll be swept away by the service, attention to detail, and beautiful surroundings before you even step foot into your room. Of course, it's easy to be impressed. Port Ludlow, a huge 37-room boutique waterfront inn, also features a 300-slip marina and a championship 18-hole golf course. Weather you're taking a kayak out in the bay to explore the twin islands or biking on one of the 26 miles of maintained trails you'll find the serenity and adventure you crave. For a truly unique experience, head out into the Puget Sound to drop some crab pots or fish for trout or salmon. Catching your dinner makes it taste oh-so-much better! 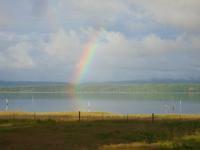 The resort is a 5-minute walk from Port Ludlow and 19 miles from Port Townsend. The Bainbridge Island ferry dock is 31 miles away. There's an upscale restaurant serving seafood and contemporary Pacific Northwest dishes, while other amenities include a spa, a golf club, hiking trails, a marina, and a store. Deep in the Cascade Mountains you'll find a beautiful woman, dreaming of respectful guests and spectacular weather. We spoke, of course, of the Sleeping Lady. Her bed is comprised of lush forests while her pillows are tall peak. Sleeping Lady's classic mountain lodge design features 58 cozy and fully outfitted rooms that will have you feeling right at home. Whether you're in a two person suite or an eight person cabin you're always in the lap of luxury. Every room is tastefully decorated, accented with beautiful woodwork and furnished with handmade furniture. Step outside and you'll have access to an abundance of activities, including rock lined swimming pool, ski rentals, bike rentals, organic garden, volleyball, horseshoes, badminton and more! During 2013 the population of Leavenworth was estimated to be 1,992 people. Sleeping Lady features over 10,000 square feet of meeting and conference space. They can accommodate groups of between 30 to 190 people. Get in touch with their event planning staff to see how they can help you. 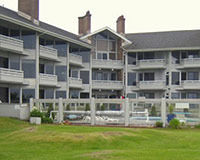 With 37 unique, charming, and independently-owned condominiums, Ocean Shores is a superb destination for all manner of occasion! Whether it's you and the your sweetheart in search of a peaceful weekend away, or a large family looking to make some memories, you'll find paradise inside a Grey Gull rental. Step in the door and take stock of the wealth of amenities at your disposal: gas fireplaces, fully-equipped kitchens in most units, and ocean or pool views. Enjoy the view from the west-facing windows, balconies, and porches! Here you can take in the sunset while also keeping an eye on the kids playing in the pool. Each unit also features its own unique charms and touches- you'll just have to keep coming back until you enjoy experience them all! The property is 2.9 miles from Ocean City State Park and 23.2 miles from Aberdeen. Amenities include an outdoor pool, a hot tub, a BBQ area and complimentary parking. Head over to sunny San Juan Island for a weekend of repose, grandeur, and fun at Snug Harbor Resort! You'll be as snug as a bug in a rug in your cozy Snug Harbor accommodations! Set on a pristine waterfront, each of their 20 spacious cabins and suites feature fabulous decor, vaulted ceilings, and uninterrupted, stunning views. The island spirit is evident everywhere you go- it's pretty chill. With plenty to do (complimentary paddle boards, kayaks, canoes and bikes), see (Mitchell Bay and the awe-inspiring coastline), and experience, Snug Harbor is the ideal place for your weekend getaway. Friday Harbor was officially incorporated on February 10, 1909. It remains the only incorporated town in the San Juan Islands. So named for the lush rain forests that surround it, Rain Forest Resort Village is ideal for groups seeking a naturally significant destination. Located in Olympic National Park and next to beautiful Lake Quinault, the Rain Forest Resort Village gives guests a picturesque landscape unlike anywhere else in Washington. The lush forests and 3000-foot ridges of the Quinault Valley make for an absolutely stunning backdrop for nature hikes, bike rides, and more. As to where you'll stay, settle into a suite, cabin, or inn and enjoy the private patio with outdoor furniture, full bathroom, cozy furniture, deluxe bed, kitchen, fireplace and more. Being located in the Olympic National Park lets you walk right out the door into dense wilderness. Adventure is out there! Lockes Landing Golf Course is located right next to the resort. It is a great course for players of all skill levels and it showcases the lush wilderness of the surrounding area. When you visit Mountain View Lodge & Resort, you'll get exactly that: a view of the mountains. Plus, you know, a lot more. Located in the quaint village of Manson, Mountain View features easy access to Lake Chelan and all the fun times that can be had on it. The lodge itself has 31 rooms in varying layouts, each fully loaded with in-room perks like deluxe beds, quality linens, microwave, refrigerator, and speedy-quick WiFi. 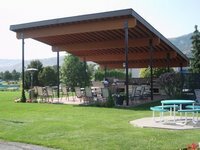 Onsite you'll also find a pool, hot tub, fire pit, outdoor furniture, outdoor kitchen, games and movies. Suffice to say, you won't be bored. But the best part is, you guessed it, the mountains themselves. From geocaching, zip lines to hiking to just about any activity you can think of- the mountain calls to you! During the last census the population of Manson was estimated to be 1,468 full time residents. The lodge is close to 11 different restaurants, five different local tasting rooms and 10 different wineries. How does a resort stay in business for more than a century? With beautiful views, gorgeous surroundings, and adept hospitality. The host spring spa doesn't hurt, either. Carson Hot Springs Resort has provided an authentic bathhouse, cozy accommodations, and a relaxing atmosphere to its visitors. The solitude seeker will fall deeply, hopelessly in love with the modern features and spacious living quarters. Should you feel a little ritzy, perhaps they can interest you in a suite, featuring kitchens, balconies, and hot tubs. Of course, you can't visit Carson Hot Springs Spa and Golf Resort without (you guessed it) a visit to the spa and a round on the golf course. Get over here and get out there! Whether you're looking for rest and relaxation or thrilling outdoor adventures, you'll find it year-round at Sage Vacation Rentals. Peruse Sage's extensive collection of premier vacation rental homes, condos, and cabins and find something that fits your unique situation. There's plenty of options to pick from, from cozy lakeside retreat to grand hilltop estate with views of the valley. Romantic partners can find tranquility in abundance, while families will discover oodles of fun. The valley is renowned for its 300+ days of sunshine a year which, of course, means a huge variety of outdoor activities. Add in Sage's incredible personal service and you have a can't-miss destination! Mountain Biking in Lake Chelan is one of the best ways to get into the woods, get some incredible exercise and also have some adrenaline filled thrills on the downhill descent! Formed over 10,000 years ago, Lake Chelan is over 50 miles long and the third deepest lake in the US at just under 1,500 feet. All of Oceanfront Getaways' properties are luxurious and spacious- let's look at one in particular to give you a taste of how amazing they can be! Sea Hope Cottage is a cozy property located at Klipsan Beach on the beautiful Long Beach Peninsula. The home features a southern style wrap-around porch, covered and partially enclosed by glass for all-season enjoyment. It's also decorated with charm and surrounded by nature, perfect for sitting and watching deer graze in the yard with the Pacific Ocean surf in the background. The porch also features an outdoor dining area, so grab some dinner while you watch a spectacular sunset! If you come on Saturdays during the summer you'll find a small festival/market underway! Try salmon, sturgeon, halibut, albacore tuna, or bottom fishing on the Pacific Ocean or the Columbia River. The beach is only about 75 yards down a private path through the dunes. With five unique properties in their catalog, Brunners Lodge is an ideal destination for anyone looking for a luxury Leavenworth destination! These aren't small bungalows- the properties at Brunners are meant for groups of 12 to 18 people. Among their many charms, you'll enjoy spacious decks with hot tubs, fire pits, and many yard games- and that's just outside! Step inside to be truly blown away. Updated kitchens, multiple bedrooms, custom log tables, stacked game rooms, and so much more. From the open floor plan to the easy access to a multitude of surrounding trails, there's a seemingly endless amount to love here. Stick your toes in the river flowing five feet off the front deck, and thank your lucky stars you're here! Love golfing? Check out Kahler Glenn, just six miles away! Fish Lake is open year round and is about 4 miles from our homes- we'll give you three guesses about what you should do there! Chateau Westport Resort's varied collection of rooms can fit any occasion, whether romantic getaway or family reunion! For the ultimate luxury experience, a stay in the Chateau Suite is just what the doctor ordered! Inside you'll find a living room with a fireplace, two bedrooms, a dining room, full kitchen, private sauna, and more amenities than you can shake a stick at! Sip a cup of coffee or tea and unwind in the private sauna or on the balcony. Then get out and experience the gorgeous Washington coastline for yourself! 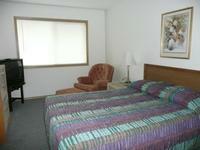 The resort is a 12-minute walk from Grays Harbor Lighthouse and 6 miles from Grayland Beach State Park. In addition to free continental breakfast and parking, amenities include an indoor heated pool and a hot tub. We've been talking about mountains a lot, but how about it's polar opposite: the ocean? Chaitaiqua Lodge is a peaceful retreat set against a gorgeous ocean setting, and the perfect place to unwind! Inside the lodge, guests find that the gorgeous seaside beauty extends in every aspect. All of the resort's 120 units face the ocean and feature balconies or patios that offer guests the opportunity to view beautiful sunsets and enjoy the sounds of the ocean waves. Sink into a dreamlike state of pleasure and relaxation. Then go outside and take a walk down the gorgeous coast or go fishing for "the big one". The hotel is a 3-minute walk from the Discovery Trail, and 6.9 miles from the lighthouse at Cape Disappointment State Park. Other amenities include an indoor pool and a hot tub, plus a private courtyard with BBQs and picnic tables. Beachwood Condos & Resort is an ideal destination for any and all occasions! The sheer value you get when you stay at Beachwood is mind-boggling, and you'll realize that from the moment you step inside. From the fully-furnished living room and bedroom to the wood burning fireplaces, every aspect of your property oozes comfort and class. Meanwhile you'll have access to a viewing tower that overlooks the north-west coast, a Clam Hut for cleaning seashells, and so much more! Gray Whales are also known as the Korean and California Gray Whale. Oyhut Bay Seaside Village's preposterous amount of charms, amenities, and hospitable staff make a stay one you'll never forget! Each and every rental property here is held to the strictest standard, meticulous upkept and lovingly furnished to provide guests with a stupendous experience. Simply step outside your property and you can enjoy long walks on the beach, explore the neighboring 683-acre wildlife preserve, and so much more. For those more naturally-inclined, the Oyhut Wildlife Recreation Area will be paradise. With its 23 miles of inland freshwater canals and lakes, spend your days fishing, paddling, and kayaking to your heart's content! Afterwards return to your cozy Oyhut Bay cottage for some well-deserved R&R. Make sure you check out Oyhut Bay Bistro and Loft- Martini and Wine Bar! Kayaks and paddle/skim boards are available by appointment in the off-season, and onsite all summer long.